As piano builders and rebuilders, we have inherited a crude and archaic system for measuring the balance of the action mechanism. The weight of the hammer, which sits out on the end of a long lever arm and has such tremendous influence on touch and tone, is measured in weight to the nearest pound of a sheet of felt from which many sets of hammers are made. We assume the proportion of key to hammer movement is roughly 1:5, but have no reasonable means for accurately measuring this ratio or detecting leverage problems. The keys are “balanced” using downweight as a primary indicator but “balance” implies a state of static equilibrium and downweight is taken from the moving key. We know that when a piano is built, the weight of the action parts sitting on the back of the key exerts an upward force at the front of the key which is too high without the addition of keyleads to the front of the key. What is the effective weight of the action parts? How does their weight translate to an upward force at the front of the key? How much is the downward force at the front of the key? Conventional wisdom simply does not provide answers to these important questions. The units of the New Touchweight Metrology define the balance of the upwards and downwards static forces at the front of the key as contributed by the weight and leverage of each action component. The piano action may seem like a complex mechanism but in fact it acts as a simple lever that propels a hammer into the string. It functions as a catapult, with a short lever arm on one side of a pivot and a long lever on the other. The long lever arm is shortened into what engineers call a “folded beam” by use of the wippen and shank levers. 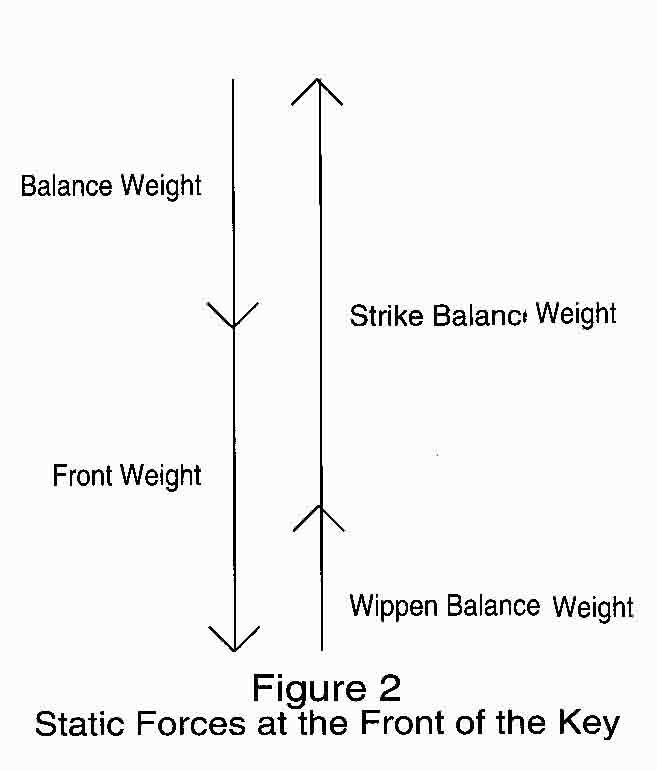 The downward static force of the Strike Weight is multiplied through the combined leverage of the shank, wippen, and key to the upward force of the Strike Balance Weight at the front of the key. When measuring UpWeight and DownWeight the touch weights are placed on the key centered on a point 13mm in from the front vertical edge of the key. 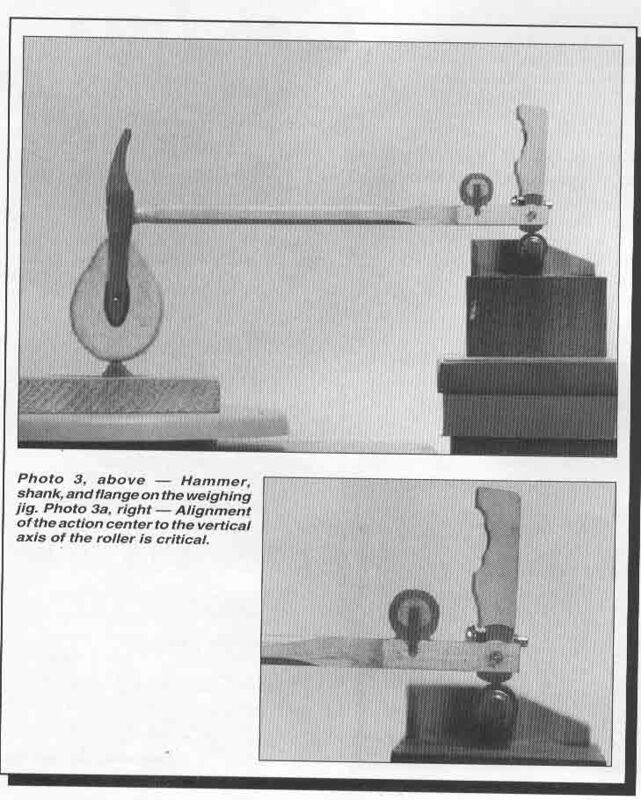 When the balance weight is placed on the front of the key it is balanced and motionless as if it were a balanced scale. Additional weight must be added to the balance weight to overcome friction and start the key moving down (DownWt) and weight subtracted from the balance weight to start the key moving up (UpWt). Front Weight– The radius weight of the keystick pivoted on its balance point, taken at the front of the key. It represents the downward static balancing force at the front of the key. Front weight is found by placing the key on a wedge pivot so that the balance hole is centered across the edge of the wedge. The front of the key rests on a roller bearing which is on the pan of a digital scale. The key is oriented in a horizontal attitude similar to that when the key is at rest in the assembled action. The roller bearing rests on a vertical axis through a point on the surface of the key 13mm in from the front vertical edge of the key (see Photo I). Wippen Weight– The radius weight of the wippen pivoted on the wippen center, where the capstan contacts the wippen heel. The wippen heel rests on the roller at the capstan contact point. The wippen flange rests on the felt wedge so that the wippen center is aligned with the vertical axis through the center of the roller. If necessary the flange may be wedged with a sliver of wood to prevent the flange from rotating (see Photo 2). Strike Weight– The hammer weight plus the radius weight of the hammer shank, pivoted at the hammer flange, taken at Strike Line Radius. The strike line of the hammer rests on the felt wedge block and the end of the tipped up flange rests on the roller so that the flange center aligns with a vertical axis through the center of the roller. The height of the roller is adjusted so that the shank rests horizontally. Playing cards can be helpful as shims (see Photo 3). Key Ratio– The ratio of down- wards force at the capstan to the corresponding upward force at the front of the key. The key is set on the jig as for weighing front weight. An amount of weight is placed on the front of the key to make the front weight at least 70 grams. Two 50-gram weights are placed on either side of the capstan so that there combined center of gravity is at the capstan/heel contact point. The scale will then read how the 100 grams translates to the front of the key. For instance, if the scale reading were -57.0 the key ratio would be 0.57 (see Photo 4). Top Action Balance Weight– The total upward static force at the front of the key resulting from the leveraged weight of the wippen, hammer, and shank. Strike Balance Weight– The upward static force at the front of the key from the leveraged weight of the hammer and shank. Strike Ratio – The amount of weight to balance one gram of strike weight at the front of the key. The New Touchweight Metrology bridges from the old Metrology of DownWeight and UpWeight through the Balance Weight, thereby maintaining the connection to traditional touchweight parameters. The array of information provided by the New Touchweight Metrology gives a wealth of information that has heretofore remained hidden from us. Of particular utility is the ability to measure hammer weight “on the shank” and the calculation of Strike Ratio. 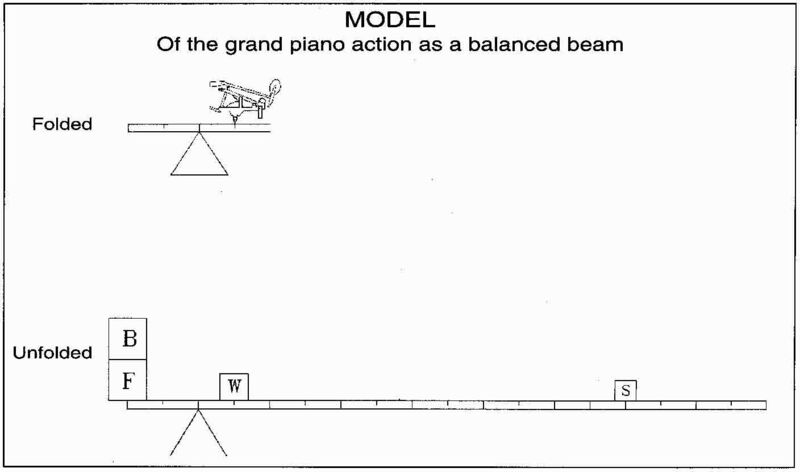 The New Touchweight Metrology provides a useful and relevant framework for a more complete understanding of the balance of piano action mechanisms. 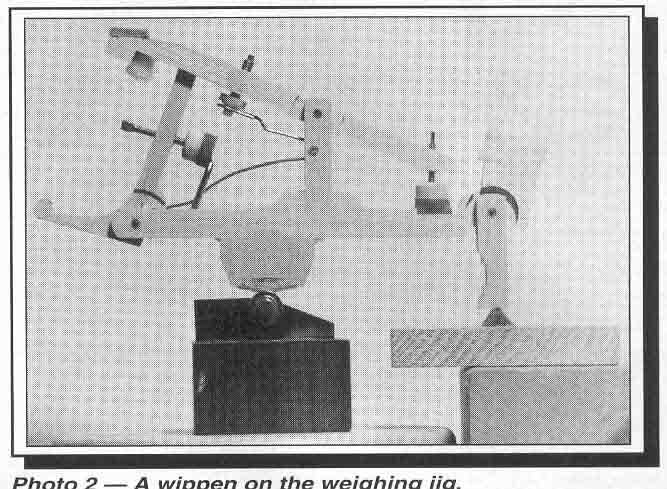 The weights and measures described above only partially describe the units and methods of the New Touchweight Metrology. Other units and methods will be described in future articles. Weight, by David C. Stanwood, RPT. 2. For this work, a scale needs to have 150-gram capacity and resolution accuracy of 0.1 gram. The roller bearing shown is an “idler bearing,” which can be purchased from small parts component suppliers. In a pinch, an edge-trimming router bit can be used. 3. In all cases it is only necessary to carry the decimal to the nearest tenth except for the “key ratio,” which is carried to the nearest hundredth. This entry was posted in david stanwood, media release and tagged piano technician, piano technicians guild, piano tuning, precision touch design on 06/06/1996 by David Stanwood.